Ambrose on his historic appearance at NASCAR's opening round in Florida. Q: How will it feel to start the Daytona 500? MARCOS AMBROSE: "We're going to be lining up for the 500, which is a huge relief. We support - Michael Waltrip Racing and JTG-Daugherty Racing supports - NASCAR's move and position with this stance. As it's played out here every team has earned their position in the top-35, three teams have dropped out in the off-season so it's natural that some get shifted up. "We support the top-35 rule as well, it's designed to help protect full-time teams and sponsors have some security to their sponsors and to make the year work properly. I just feel quite lucky really, to be honest with you. Someone is looking after me, I'm not sure who it is, but their doing a good job." Q: What are your thoughts about NASCAR's decision on the top-35 rule? MARCOS AMBROSE: "With a situation like this, as far as I'm concerned, it's completely out of my hands and so whichever way the decision was going to go or will go doesn't change who I am and how I go about my racing. I'll just deal with the situation as it is. "I've always said that I feel lucky to be in NASCAR and no matter what decision was made on the race track or off, I was just going to roll with it because I feel privileged to be here and that to me makes me sleep easy. "Whichever way it goes I can only do what I do out there and I can just don't lose sleep on that kind of stuff. I've been a professional driver long enough to know that if you expect the worst at all times then when the good times roll it really is enjoyable." Q: Did your team bring a 'qualifying' car to Daytona for this week? MARCOS AMBROSE: "The last three or four days have been a bit of a panic. We were going to use the (Gatorade) Duel as a chance to really just grow into the car. I haven't driven a COT (Car of Tomorrow) on a superspeedway. I've only had a couple starts here at Daytona anyway so I am going to use the Duel really just to get into the groove and get confident and comfortable behind the wheel and just try to find some good drafting partners and let them know that I'm not an idiot out there. I will work with people if they want to. "That was our intention and then three days ago or four days ago when it looked like it may have been swinging against us we started really then trying to re-focus on trying on getting a qualifying car, which is quite an aggressive set-up car. "But now we are back in the race, so we'll just look to settle ourselves in during our Duel." Q: What has it been like to work with Frankie Kerr? MARCOS AMBROSE: "Frankie (Kerr, crew chief) is just a jewel and he's a wonderful guy. He's just great for our team. I think JTG Daugherty Racing is in a great position. We've got guys like Frankie (Kerr) behind us with a lot of experience and knowledge. "We have just a wonderful technical alliance with Michael Waltrip Racing and effectively we're a third car for Michael Waltrip Racing and we've got a lot of support from all those guys over there as well. It's just a really good combination. It's just a great partnership, it's like a marriage and I think that's going to benefit all parties and I think we're in a great spot to take advantage of this year. "There's a lot of turmoil and change in NASCAR and the economy and everything right now and I think we're in a position to really take advantage of all that. This Daytona 500 -- are we in or are we out thing -- is just really a blip in our overall goal and objectives for the year and I think we're going to have a stellar year and a breakout year for Michael Waltrip Racing and for JTG-Daugherty and I'm just really looking forward to getting the season started." MARCOS AMBROSE: "It really does change our whole outlook for the first five races. Like I said, we're in a great position with Michael Waltrip Racing and JTG-Daugherty -- I think we're a team that's really on the rise and going to take full advantage of the shake-up that's happened in NASCAR over the last three months. "We support NASCAR's decision with the top-35 rule. As it's played out here, every team that's in the top-35 at this stage has earned their way in. They're in there on merits -- they're all full-time teams with full-time sponsors. I think it works out for the best, for all parties involved. "We've got brand new sponsors here on our team -- Little Debbie, Kingsford, Clorox, Bush's Beans -- they're all brand new to the Sprint Cup level. We're bringing brand new sponsors to the Sprint Cup level when sponsors are at a premium and to be able to give them a full season is very important. I've also got my great personal sponsors, Jeld-Wen, so it's just a good situation for everyone." Q: Is this the best opportunity you have had in your racing career? MARCOS AMBROSE: "Absolutely no doubt, I'm in the best position I've ever been in my racing career and I just really feel privileged to be here at this point. I feel a little under-cooked, coming in I've had a few races at the Sprint Cup level last year, to know what to expect. I haven't driven a COT on many types of race tracks, short tracks and superspeedways -- the big ones are the ones that really stand out in my mind. "I'm going to have to grow into the Sprint Cup level and I know I'm going to make mistakes, but I just really want to pay everybody back for the choices I've made that have put me in this ride. There's a lot of people that have made choices to let me get this far in NASCAR and I just want to pay them back. I want to make them proud of the choices they've made and that's what I'm focused on. "I'm not looking at top-10s, top-fives, wins or anything like that -- that's not important to me. What's important is that I make the people that have made the choices getting here -- I want to make them feel good. I want to make them feel good about the chance they've given me to start." Q: How do you think you have earned the opportunities you have had in racing? MARCOS AMBROSE: "My whole career has been, 'Why me?' I feel like I'm no better than the guys I was racing go-karts with when I was 13. I just feel like someone's looking out for me and I just try my very best -- I commit to myself, I commit to everybody that helps me and I just try to be myself. "I think I've got a point of difference, I'm from Australia, which I thought was going to be a draw back when I first came here, but it may well prove to be a benefit. I've been well-accepted in NASCAR and I've just been able to survive. Kenny Schrader told me when I first came here, he said, 'Marcos, if you just don't cause trouble, you'll hang around for a while.' So I just try my very best not to cause trouble. "Sometimes it's inevitable, but I just try to do the right thing as often as I can to everybody -- to the fans, to the other drivers, to NASCAR, to my sponsors -- I just try to do the right thing." Q: What will it be like for you on the starting grid of the Daytona 500? MARCOS AMBROSE: "I just can't wait. I'm so looking forward to it -- just the anticipation of my first 500 start is something that I've aspired to for so long and I dream of and I just can't wait for the day. It's going to be a great day and that's the best part of any race is that three minutes before they tell you to start the engines. You're on the grid, the crowd's there, you can hear them because you haven't got your helmet on and just the anticipation of what's about to start. I'm just looking forward to that chance to experience it." Q: Are you where you want to be in racing? 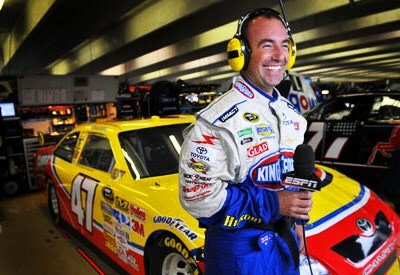 MARCOS AMBROSE: "I'm where I want to be. I'm in a great spot with my team and the sponsors and the help from Michael Waltrip Racing -- it's a dream chance, it's a dream run I've had in NASCAR. I've been in NASCAR for three years and here I am talking to you as a Sprint Cup driver. "It's a meteoric rise and I still ask myself every morning, 'How did this happen?' It's like I've done this before in my career. I managed to make a career back in Australia and won a championship or two and still wonder how that happened. Here I am in NASCASR four years later and feel privileged to be here today with just a great opportunity. "I've got a chance to really cement myself. I said to Frankie Kerr, my crew chief, that this is either the beginning or the beginning of the end because there's no way to hide at this level. When you get to Sprint Cup and you're up against (Dale Earnhardt) Jr. and Jeff Gordon and Jimmie Johnson and everyone, the whole field is just supremely talented and high quality teams. "There's just nowhere to hide and I'm looking forward to that chance to really prove or disprove who I am as a NASCAR driver. Whichever way works out I'm cool with it too. If you get into the season and get toward the end there and don't show the promise that's needed, I'll be the first to put my hand up and say, 'I did the best I could.'" Q: How does NASCAR compare to other racing series you have competed in around the world? MARCOS AMBROSE: "NASCAR is so big and the sport is just so big that everything else just pales into insignificance -- it really does. This is by far my biggest achievement -- to be here today talking to you guys. It's my biggest achievement in racing. Forget winning races and winning championships, I think just getting this far in a sport like NASCAR is massive. "I've come from a long way away -- I've come from the other side of the world in a place called Tasmania, which wouldn't even know what a stock car was five years ago and I've travelled a long way, I've committed a lot with my family and my friends and here we are."